Speaking at the NAMIC Global AM Summit, Senior Minister of State for Transport and Health Dr Lam Pin Min cited the collaboration as an example of how the Government can do more in strengthening partnerships between the public and private sectors across various industries. “There is much scope for the public and private sectors to work together, to bring together a matching of expertise and resources, to develop ideas and bring them to fruition,” he said. Appended below are the 5 MoUs signed with NAMIC: 1. 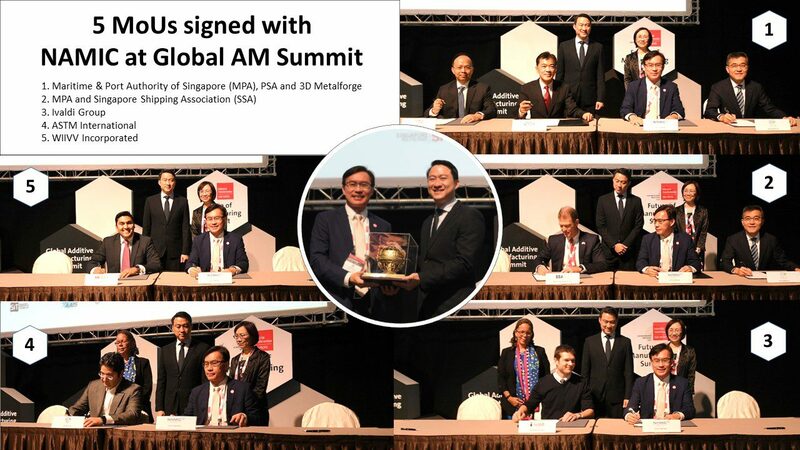 Maritime & Port Authority of Singapore (MPA), PSA and 3D Metalforge; 2. MPA and Singapore Shipping Association (SSA); 3. Ivaldi Group; 4. ASTM International and 5. WIIVV Incorporated.